QUINN Hugh (Hughie) died November 5, 2018 peacefully at hospital. Beloved husband of Lily. His remains will leave from his home, 22 Highbury Gardens, Ardoyne on Wednesday November 7th for 12.30pm Mass in Holy Cross Church, Ardoyne and afterwards to Roselawn Crematorium for 2.30pm. 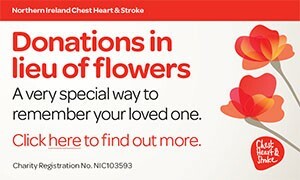 Family flowers only donations in lieu to NI Hospice. Will be sadly missed by his wife Lily. I am sorry to tell you that Hugh (Hughie) Quinn has passed away.